You’ve got to hand it to Huawei. Just a week out from Apple’s iPhone 6S launch, it’s revealed the Mate S, which has almost certainly stolen a bit of the Apple phone’s thunder by including its iOS rival’s expected lead feature. The Force Touch control exclusive to the top-of-the-line 128GB Mate S is of course the headline spec of the flagship, beating Apple to the post (at least in terms of the unveiling, if not the on-sale date) if the Cupertino company really is planning on putting Force Touch in iPhones. Though its application may be limited, it works surprisingly well–being able to use a virtual magnifying glass on portions of a photo by pushing down with differing degrees of pressure for different zoom levels was quite nifty, and takes advantage of the full HD resolution screen. I wasn’t able to test the touted weighing feature, which turns the Force Touch screen into a set of scales for small objects, but it’s an inspired idea if it works. However, by limiting Force Touch to the top-tier Mate S, Huawei may have killed the feature before it’s even got out of the traps. The Android market is already fragmented in terms of individual hardware set ups unique to disparate phones, and Huawei has massively limited Force Touch’s audience by making it exclusive to the most expensive model. As such, what incentive is there for third-party app developers to get on board and play around with the promising technology? An iPhone 6S with Force Touch as standard will be able to court many developers knowing that their apps will have a potential audience of millions. Despite the Mate S Force Touch feature being honestly interesting, it’s hard to see many developers taking a chance developing for such a likely small portion of the Android audience. 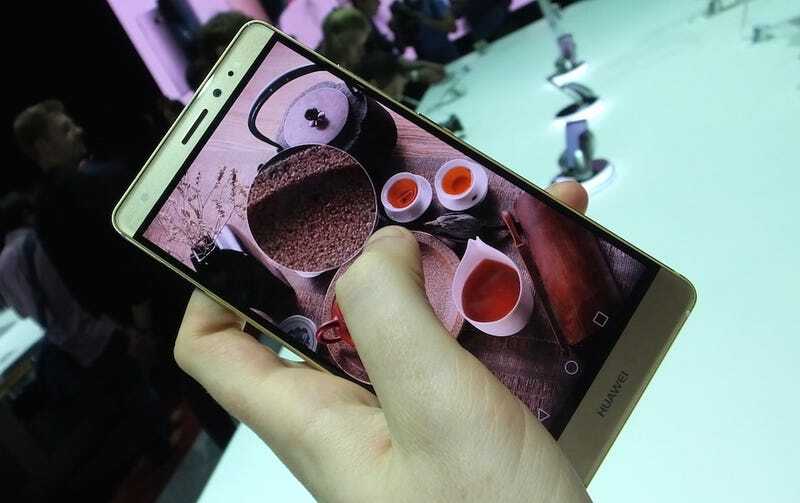 Still, Force Touch isn’t the only thing the Mate S has going for it. For starters, it’s got a genuinely useful rear finger print scanner, used not only for unlocking the phone, but other controls too. A horizontal swipe lets you scroll through gallery images, while a vertical one pulls down notifications. Tap the sensor with the front-facing camera activated and you’ve got yourself a selfie-snap trigger, too. Even after just a few minutes with the phone, I found myself pulling down the notifications toolbar and scrolling through photos intuitively – something that on paper I’d have likely sniffed at. The phone itself is tidily designed. With a slightly curved 5.5-inch 1080p display, it makes use of an all-metal waterproof unibody design that sits somewhere between an iPhone 6 and the HTC One M9. Only 2.65mm at its thinnest thinnest point, its tapered back and angular edges make for a comfortable fit in the hand. A 13MP rear camera with manual controls performed surprisingly well in the low light conditions of the demo hall and, despite its ludicrous nature, those that wish to crop their photos using “Knuckle Sense 2.0” rather than their fingertips will find that the phone can accurately determine when it’s a finger joint rather than tip fondling the screen. Running Android 5.1.1 from a speedy Hisilicon Kirin 935 processor, the Mate S seemed zippy enough on the stock apps provided on Huawei’s demo unit. But it’s the Emotion UI that lets things down. It’s just not as pretty as the hardware it’s paired with, and decisions such as the complete removal of the app drawer (again aping Apple) make no sense when Android is at the core. It’s a promising handset then overall, marred at first glance by some strange decisions and feature creep. Going up for pre-order on September 15th, the standard edition 32GB/3GB RAM grey or champagne handsets will cost 649 Euros (around $724) while the 64GB/3GB RAM gold and pink versions will cost 699 Euros (roughly $780). No word yet on release or pricing for the 128GB model – a pity since it’s the only one that’ll come with the Force Touch screen. Expect it to be notably more expensive whenever it does arrive. Editor’s Note: Huawei says it has no plans to launch the Mate S in the United States because it has other phones in mind for America.